With audiences streaming into V&A Dundee over its opening weekend to get a view of the inside of Japanese architect Kengo Kuma's landmark building – his first in the UK – and marvel at the space, the carefully chosen views upon the River Tay, and a distinctive wooden decoration upon the vaulting walls which reminds us of a 70s lecture theatre, it's possible to forget that the purpose of this building is to be a gallery. There are two exhibitions to see, one temporary and one permanent, and it's the former which has been given the unenviable task of competing with the building itself. As far as attention-grabbing shows go, however, Ocean Liners: Speed and Style (★★★★★, until Sun 24 Feb) is impressive enough that it stops you thinking about the structure surrounding you while you're within it. A walk-through exhibition, it seems to build in scale as you move through each room, revealing ever-grander sights and dozens of little points of informative interest. 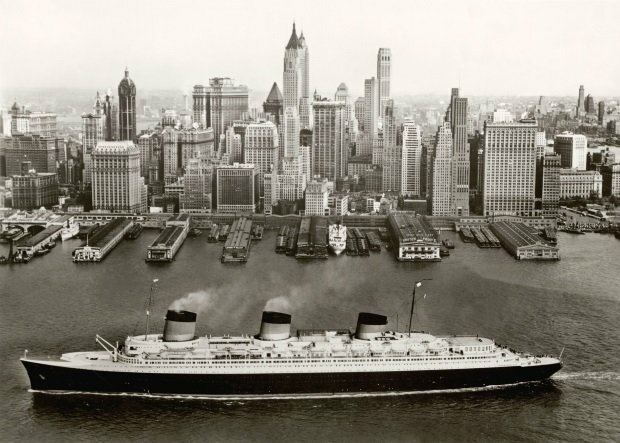 The first comes right at the beginning, for example, with the point being made that the first great use of seafaring ocean liners was as a means of mass migration across the world, particularly to the United States; until the introduction of immigration controls in the 1920s meant the liner companies had to concentrate on upmarket first class and VIP transport instead. Later on in the show we see an actual door recovered from the Titanic, picked out in a murky spotlight, and the sense of drama combined with meticulous research in this popular blockbuster-in-waiting is worthy of James Cameron. As fits the remit of the V&A itself, the amount of design history being elaborated upon is overwhelming, from the striking posters used to advertise these boats; to the interior design, fixtures and even crockery which was used on board; to the actual construction of the ships themselves. More than interesting things to look at, however, the welcome social and political concepts explored really help to transport the viewer back to these ships' great era, from the River Clyde's great history of their construction, to their use during war and as symbols of state power and prestige, to the industry's eventual decline, even as designs for new and futuristic models were in preparation. The kinds of clothing and plush cabin furniture which their guests preferred are seen, a glimpse into another world in their own right. Even for the non-seafaring viewer, hours could be spent in here soaking up every detail. 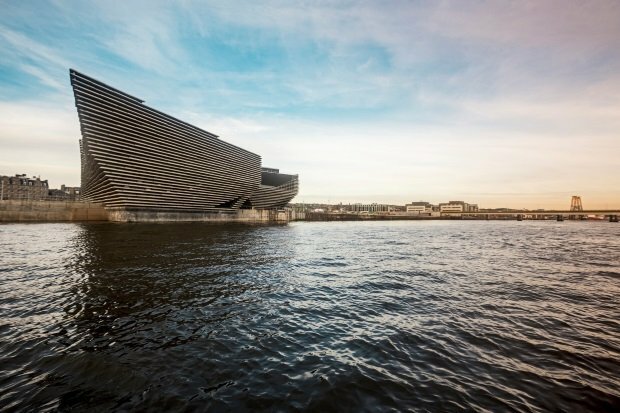 The Scottish Design Galleries (★★★★☆, permanent exhibition), meanwhile, is the show that will be seen continuously throughout the new V&A's life – the website, presumably as the result of some glitch or other, lists the closing date as 2043 – and it's the one which links the place to the country surrounding it. Not as expansive as the temporary show in the other space, it's, if anything, more densely packed, with samples, drawings and models taking us through five centuries of Scottish innovation. This includes a long list of familiar objects: the kaleidoscope, the Hunter Wellington boot, linoleum from Kirkcaldy, the Orkney chair, the racer-backed swimsuit, the golf ball and many others. There are also sections on the architecture of Robert Adam, the Forth Bridges, the Falkirk Wheel, the Maggies Centres, Cardross Seminary, the Hen House at Fiscavaig on Skye, and designs for old Glasgow tenements and 20th century high-rises, and it's also pleasing to see John Byrne's original 1970s backdrop for the rural tour of The Cheviot, the Stag and the Black, Black Oil amid a section on theatre design. Although the comics section feels slightly misjudged; for an exhibit celebrating design, perhaps more Scottish artists rather than writers might have been shown. It's great to see Dundee's ever-reliable Beano so heavily featured, however. Across both galleries there's almost too much to pack in, which adds to the sense that the V&A is a full day-out's worth of adventure. Its exhibitions contain much for a broad audience to think on, marvel at and be educated by, and that's all the purpose they really need in a setting where they're an accompaniment to the surrounding main event. A look back at the golden age of ocean liners, with over 250 objects including paintings, sculptures, ship models and objects from shipyards.